Move over, Marseille, it’s time to head west. To Toulouse, specifically, the Occitanie capital situated a mere 93 miles from the Mediterranean Sea. This fascinating city of around 950,000 people is a four-hour drive from Marseille and seven hours south of Paris. The city’s location allows for gorgeous southern European weather year round (Toulouse averages a very mild yearly temperature of 56.8 degrees Fahrenheit). Choose to bask in the sunny warmth of the city in the summer, or plan a perfect holiday escape when northern Europe turns cold and snowy during winter. The gorgeous Mediterranean weather isn’t the only reason to visit. The southwestern French city is known as La Ville Rose, the Pink City, thanks to its red brick facades. 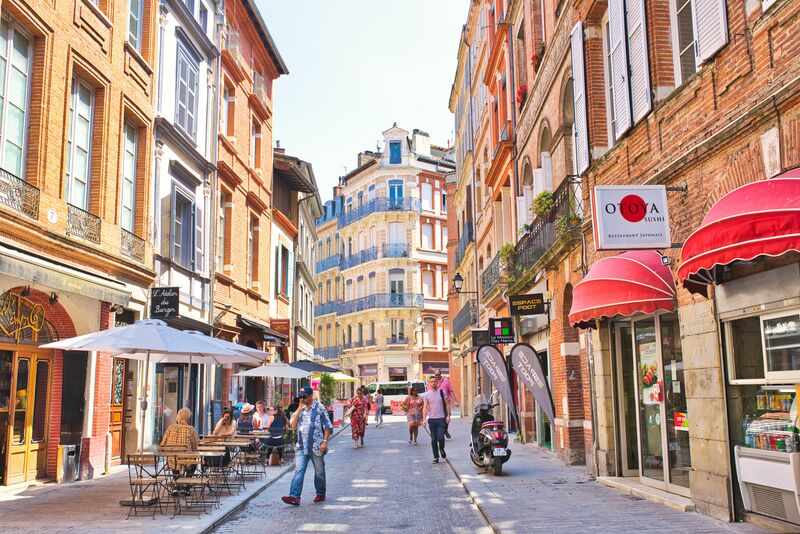 Beyond its rosy charm, Toulouse is known for its culture, cuisine, and culinary specialties, with a cool, laid-back atmosphere that is a product of its fantastic cafes and outdoor restaurants. Locals and travelers alike enjoy the nearly endless list of great dining options and cultural highlights, making Toulouse one of the coolest French cities you need to visit on your next jaunt to the South of France. 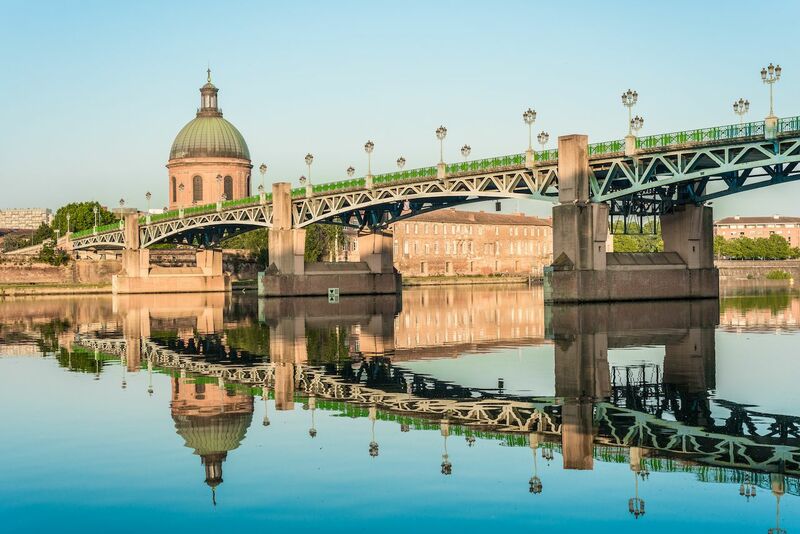 Toulouse is an architecture lovers’ dream destination. Toulouse is full of beautiful buildings begging to be photographed. The Place du Capitole is the city’s most popular architectural feat. The building has a fantastic pink brick facade featuring eight columns that glow in the Mediterranean sunlight. The square that surrounds the capital is the life of Toulouse, and locals assemble there throughout the day. Local music festivals are hosted here throughout the year and the area is popular with students, who spend time on late afternoons watching artists and musicians play. Take the adjacent Rue du Taur and you’ll find yourself on a fairytale street that leads to Basilica of Saint-Sernin, with several French and Mediterranean restaurants alongside amazing creperies. The Place du Capitole isn’t the only city center building to have the red brick outer layer. Many of the brilliantly designed buildings have been restored and, like the Place du Capitole, they glimmer in the sunlight. Toulouse has done a brilliant job of preserving its architectural past, making it an ideal location for culture vultures. 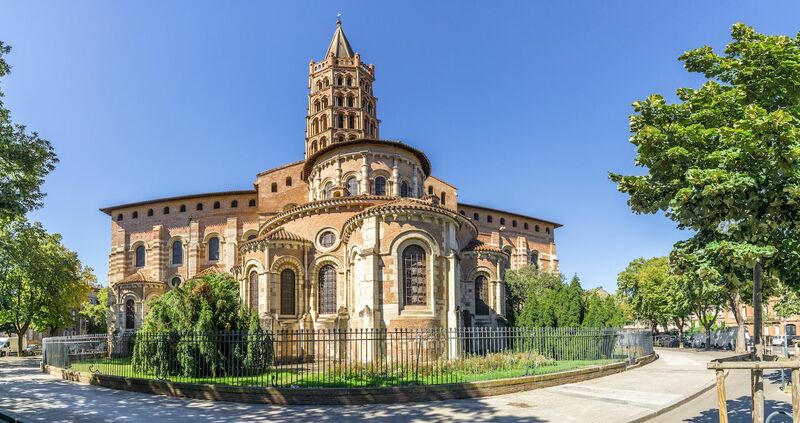 Basilique Saint-Sernin is a UNESCO World Heritage Site dating back to the 11th century. Like the other historic buildings in Toulouse, it was built using red brick. While the outside is fascinating, the inside is even better with impressive ornate sculptures inviting visitors to look over every detail. 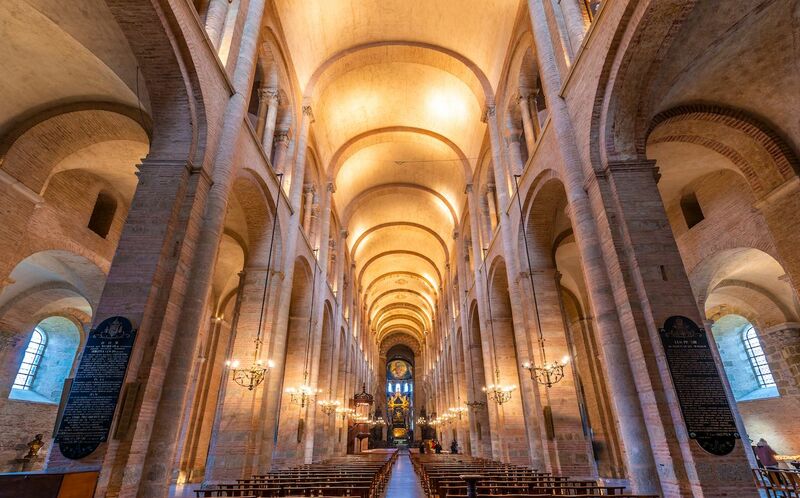 Basilique Saint-Sernin has exhibits on throughout the year for visitors to experience. The Cathedral of Saint-Etienne is another holy building that decorates Toulouse’s skyline. The cathedral, built in the 12th and 13th centuries, took 50 years to finish. It’s famous for blending architectural styles including Southern Gothic and Northern Gothic. The cathedral contains 17 chapels and you can explore each on your visit. If you find yourself in the city on a Sunday, do check out the famous Saint-Sernin Market, where sellers from across the region come to showcase a wide range of items for cheap prices including clothing, antiques, souvenirs, and household goods. The city’s culture is built from its rich history — and an obsession with rugby. Museums are a major attraction in Toulouse, such as the Musée des Augustins, a fine arts museum, located in a former monastery. Art lovers will find a great collection of paintings and sculptures from the Renaissance period to the 20th century. The Fondation Bemberg, or Museum of Fine Arts and Decorative Arts, is located in the Hôtel d’Assézat. The gorgeous building, a 16th-century mansion on the Rue de Metz, hosts a collection of sculptures, paintings, and other artistic creations. Alongside the Garonne River, Les Abattoirs is a mdoern art museum and is home to over 4,000 pieces of artwork. Then there’s the Musée Saint-Raymond, which hosts a number of archaeological wonders dating back to prehistoric times. Beyond the museums, you can’t mention culture in Toulouse without acknowledging rugby. It’s one of the greatest rugby cities in the world, and for many who call Toulouse home, rugby isn’t just a sport, but a way of life. For this reason, Stade Toulousain is one of the biggest and best rugby clubs in Europe. Stade Toulousain has won the French championship 19 times and the Heineken Cup on four occasions. Visitors looking for a true taste of Toulouse culture can get it at the Stade Ernest-Wallon on match days when the Rouge et Noir take to the pitch. The culinary scene blends world-class wine with fine local cuisine. Bordeaux and Toulouse, both great wine growing regions, have a rivalry that dates back generations. While Bordeaux gets a lot of praise for crafting fine wines, Toulouse is no pushover. Start at N°5 Wine Bar, an award-winning establishment where you can sample a red or white wine and finalize your dining plans for an evening on the town. 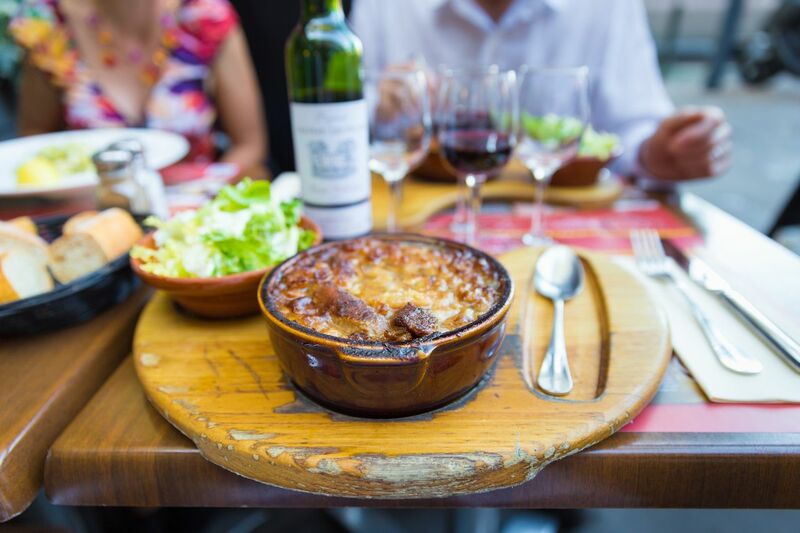 Toulouse has a diverse range of traditional foods, perhaps the most famous food of which is a fatty stew called cassoulet. The traditional Toulouse version of the stew is made with beans and duck meat. Foie gras d’oie, or goose liver, is decidedly French and something you have to try when in Toulouse. Foie gras d’oie is a popular food to put on bread and to eat while sipping red wine. If goose doesn’t sound like your thing, then try confit de canard (duck). It’s one of the most famous French dishes, prepared in such a way that the meat falls right off the bone. Tarte aux noix is a Toulouse dessert favorite. The nut pie goes great with a side of ice cream and is perfect to top off any meal. Working off all that cassoulet will be a breeze. 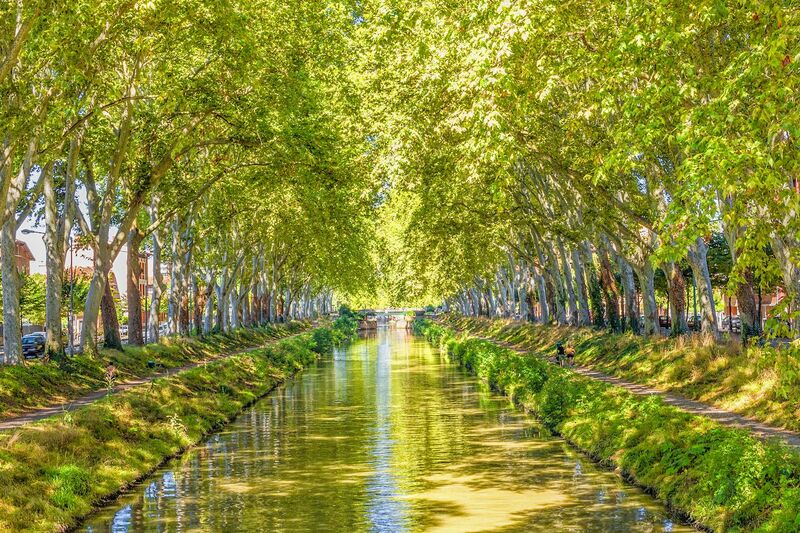 If you need to stretch your legs after a large lunch and a few too many glasses of wine, head to the Canal du Midi — perhaps the coolest spot in all of Toulouse. First conceived in 1667 and taking a decade to construct, the Midi runs about 150 miles from Toulouse to the city of Sète on the Mediterranean coast. It was originally built to provide a shortcut between the Atlantic Ocean and the Mediterranean Sea, and today it’s a popular walking, running, and cycling area. To explore further afield, make the 60-mile journey from Toulouse to Carcassonne. It’s a peaceful trek that offers an escape from the fourth largest city in France. It also gives visitors the chance to get to know the local French region and to sample pubs, restaurants, and cafes along the Midi.